Have you ever thought about how important your sense of hearing truly is? Not only does it affect the way we socialize, work and communicate, but our sense of hearing keeps us safe and warns us of potential danger. On the job, hearing loss impairs an employee’s ability to understand speech, hear warning signs and notice audio alarms. And, ignoring potential “red flags” could have dire consequences. Approximately 22 million workers are exposed annually to hazardous sound levels. In high-hazard industries such as construction, aviation, and manufacturing, the risk for them developing Noise-Induced Hearing Loss (NIHL) increases substantially. It’s also financially damaging for employers as, each year, companies pay out around $242 million in workers’ compensation claims resulting from employee hearing loss. Like most workplace illnesses and injuries, prevention is key when it comes to combating hearing loss, which is why OSHA mandated Regulation 29CFR 1910.95. The standard states that “employees exposed to sound levels at, or above, 85 dBA for an eight-hour time-weight average must be provided with some means to mitigate their exposure to the hazard.” According to Project Manager Dan Moore of Rossi Contractors in Chicago, Ill., OSHA made the right decision as it pertains to hearing conservation and safety. The administration also requires that employers provide workers with a variety of personal protective equipment (PPE), and consistent audiometric testing performed by licensed professionals as part of a hearing conservation plan. In 2016, businesses in the United States paid upward of $1.5 million in penalties for not adequately protecting their workers from hazardous noise. Needless to say, choosing the right audiometric testing equipment is essential. That’s why Worksite Medical’s mobile audio stations are all outfitted with Benson CCA-200mini audiometers for medical surveillance testing. 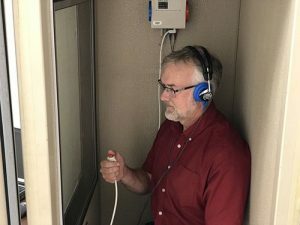 Pittsburgh Pa.’s president of hearing safety, Tim Swisher, an audiologist for over 40 years, has trained and certified Worksite Medical’s technicians to use the computer-controlled audiometer. Designed for test-booth mounting, the small, lightweight audiometer reduces test times from 25 to 40 percent; installs with fewer cables than a standard audiometer; and offers full-page reports with data and analysis. Furthermore, it’s innovative IntelliTesting feature pauses the device if background noise begins to interfere with testing. Swisher added that Benson medical instruments have been around for over 25 years, and have a reputation of producing accurate, reliable results. In fact, the United States Army uses Benson instruments for its occupational medicine programs.The CCA-200mini makes it easy and simple for all OSHA and ANSI guidelines to be met. While this offers supervisors peace of mind, the assurance that workers are safe and workplaces compliant is far more significant. Choosing the right audiometric testing is of the utmost importance when creating a hearing conservation plan. 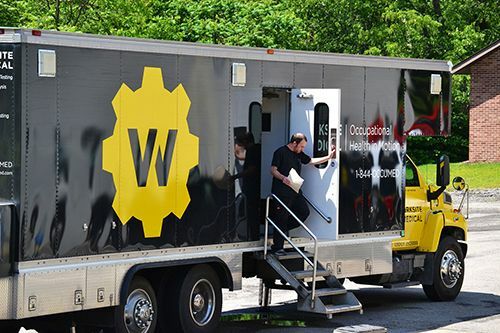 Worksite Medical stands by Benson because of it’s quality, accuracy, and overall convenience. It’s one of the reasons we saved nearly 700 businesses from OSHA fines and excessive workers’ compensation claims in 2017.